If you live in the Midwest, chances are that you know about “Morel Mushroom Madness”. Each spring when conditions are just right, morel mushrooms make their magical appearance in wooded areas, on creek’s edge, and, if you’re lucky, in your own yard. Folks flock to the woods, in hopes of bringing heaping sacks of these fungi treasures home. The meaty taste and hearty texture of morels is something to be craved. While store-bought portabello mushrooms are mighty tasty, they simply don’t compare to a morel. 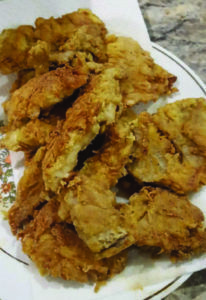 Alas, nothing beats a battered morel, fried to golden perfection, available only once per year!…Or does it? Recently, morel cultivation has become a possibility, and all but a minority of farms are currently located overseas. You may have noticed seasonal morel availability in the grocery: cultivation is the primary reason. According to my taste buds, the flavor of cultivated morels and wild varieties is virtually identical; the drawback to buying morels: a hefty price tag. Now, for a delicacy, I’m sure we can understand the expense, but most families simply don’t budget for delicacies. What is a morel – lover to do? There is an alternative to the mouthwatering flavor of morels, and a very close one at that: Oyster Mushrooms! Oyster mushrooms are a large group of mushroom with sub-strains native to the Midwestern United States. They grow from dead and dying hardwood, often appearing after a warm, wet spells in spring and fall. They come in many colors, from white to blue to pink, each one suited, not only for frying, but for use in most dishes where a portobello would be called for. Fortunately for those of us who don’t have the time, knowledge, or space to confidently forage wild oysters, they are cultivated year-round, right here in our neck of the woods. Oysters reliably provide the hearty taste and texture that morel – lovers so crave, at much lower prices. Mud Creek Mushrooms in Montgomery, IN, offers several different types of fresh oyster mushrooms year-round. They are available for purchase by restaurants, groceries, health food stores, and individuals. If you find yourself craving a morel in December, or tiring of the same flavors, remember that the best eats are local, fresh, and delicious. 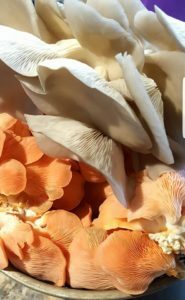 Enjoy this fried oyster mushroom recipe, see us on Saturdays at the Vincennes Historic Farmer’s Market, and visit us on Facebook with feedback, or to place orders! Put oil in skillet to cover bottom 1/4 inch. Heat over medium heat. Pull off individual mushrooms from cluster (stem and all) and cut to desired size. Dip in egg, roll in flour, then place in heated skillet. Turn when bottom is medium brown and crispy. Salt to taste before removing from pan. Suggested serving with southwest ranch dipping sauce: 1/2 cup sour cream, 1 or 2 tablespoons picante sauce, 1/2 teaspoon of garlic powder and a dash or two of hot sauce. Stir together and serve. Important to note that once removed from the pan, they should be placed on a paper toweled plate. Click on the Facebook icon to share this article and be sure to like our page! Oysters provide an excellent substitute for the flavor of seasonal morels. Oyster mushrooms come in a variety of colors and sizes. Temperatures and New Members on the Rise in June!